I came upon the name of Miroslav Magnetic when looking for information about Dr. Alexander Imich, which has (by error, I guess) called me. When I saw what I saw about this man (on his personal pages) I was totally amazed. A rare skill like his, displayed on high quality video. Rare sights indeed. 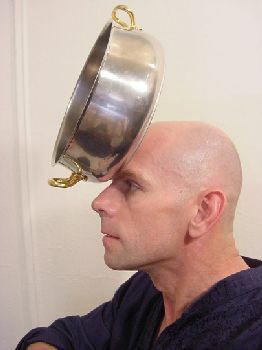 Miroslav Magola, the Magnetic Man, seems to possess strong psychokinetic powers as he can attach to himself quite heavy objects. He can attach them to his hands or to his forehead. Perhaps he can more than that, but that’s what I’ve seen in the videos. Moreover, he can hold this way not only metallic objects but also ceramic or plastic, thus eliminating real magnetic force as the source of his ability. The abilities of Miroslaw Magola are known to the most hard-line skeptics on both sides of the planet. Mr. James Randi, who has spent a large part of his life and a lot of money to de-mask paranormal phenomenon, does not dispute the authenticity of Magola´s talents (and so far has avoided a scientific inspection of Magola´s abilities). The American James Randi Education Foundation (J.R.E.F) has examined unusual occurrences across the world. The author of this book has demonstrated his talents under the scrutiny of such well known scientists as Prof. Abhaya N. Deva, Ph. D. Roland Charczuk, Prof. Dr. Dipl. Psych. Toni Forster, Prof. Alex Schneider M. Sc, Dr. U.E. Hasler, Nene von Muralt, M. D. Jakob Boesch, Prof. Dr. Konstatin Korotkov, Dr. Paola Giovetti, Rainer Holbe, Dr. Serge Kahili King, Prof. Dr. Erlendur Haraldsson, Prof. Peter Mulacz, Edgar Wunder, Jack Houck, Elda Hartley, Prof. Robert Ritch, Dr. Alexander Imich, M. D. Ph. D Barbara G. Koopman to name but a few. The prominent Russian specialist for Kirlian photography, Dr. Dobruskin, has photographed Magola’s bio-plasmic field during his demonstrations. The European scientific community has also turned their attention to the unique abilities of Magola, especially Dr.Dr. Walter v. Lacaudou from the university in Freiburg. In 1997 Dr. M. Karger of the German Max Plank Institute examined Magola´s talents and Prof. Dr. Dr. Ruhenstroth-Bauer of the same institute has proposed to include Magola in his project. Has anyone heard or seen the man? What do you say about his ability?